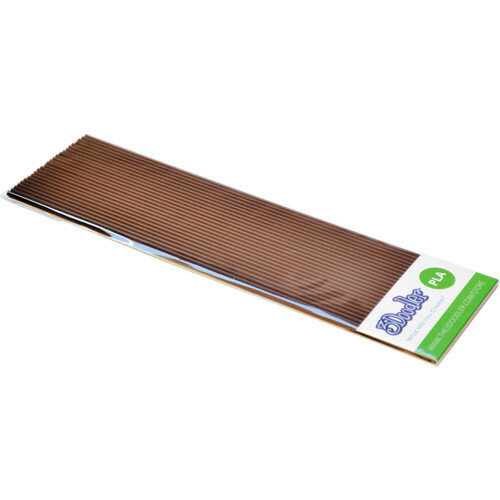 The 3Doodler PLA Single Color Plastic Pack comes in a pack of 25 brownie brown strands, each of which is straight-cut at a length of 10". These PLA strands are able to create 10" of doodles from each inch of plastic, are great for doodling on windows, metal, and other hard surfaces, and adhere well to clothing. These strands are compatible with the 3Doodler Create, 3Doodler 2.0, and 3Doodler 1.0, but not the 3Doodler Start. To ensure quality performance when using PLA strands, please ensure that the temperature of your 3Doodler pen is set to low. 3Doodler's PLA strands are made using corn and are 100% compostable. Box Dimensions (LxWxH) 10.05 x 2.9 x 0.8"
PLA Single Color Plastic Pack (Brownie Brown, 25 Strands) is rated 4.0 out of 5 by 1. Rated 4 out of 5 by Kevin from Ad glowing plastic to your 3D artwork Nice option for the 3doodler that I haven't used yet, but confirm the rods glow.